Enjoy the festival atmosphere of The Boat Race by watching for free from one of the many vantage points along The Championship Course. - Dukes Meadows and Chiswick Bridge (At the finish). A few minutes’ walk from the tube station, Putney Bridge offers great views of the two crews off the start and as far as the Fulham bend. Spectators can then walk to Bishop's Park and catch the remainder of the Race on the Big Screen. Craven Cottage, the home of Fulham FC will provide fantastic views of the Race from the Riverside Terrace. The busy embankment in front of the boathouses in Putney is a good place to see the first part of the Race. Please note spectators will not be able to see the start of the race between Putney Pier and Putney Bridge on Race Day 2018 due to construction works. A 10 minute walk towards Hammersmith along the Putney Embankment, Barn Elms Boathouse has a wide concrete landing stage from where you can see the crews as they race off towards the Mile Post. Be warned though, your feet could get wet. Ten minutes further along, the bank in front of Harrods Depository is also a good spot. 10-15 minutes walk from Hammersmith tube station, the embankment between Hammersmith Bridge & the Crabtree pub has a footpath offering good views of the river. In the right spot you should be able to see the Race for a good few minutes before the crews pass under Hammersmith Bridge. 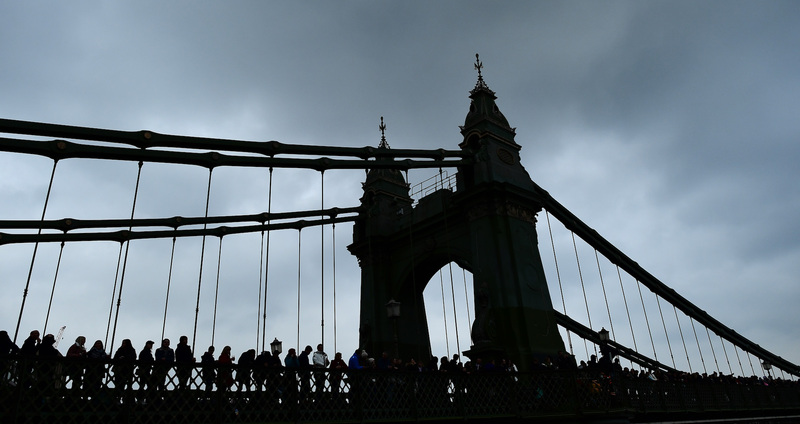 10 minutes’ walk from Hammersmith Tube Station, the Bridge has always attracted thousands of Boat Race spectators; often the tussle for the lead is fierce as the crews pass below. The Bridge provides good views as the crews come in to view from around the Surrey Bend or as they race into the distance towards Chiswick Eyot and Barnes. Located close to Hammersmith Bridge on the Surrey bank and accessible from the towpath, the space in front of the boathouse provides a good view of the crews battling at close quarters as they race off towards Chiswick Eyot. Another place to be careful your feet don't get wet. Of all the good viewing points on the Middlesex bank all the way from The Dove to Dukes Meadow, Chiswick Pier is one of the best. One of the crews often puts in a decisive push at this stage.